The general appearance of NOCOLOK® brazed parts can range from relatively bright to light grey depending on the flux loading and furnace dew-point. When either is increased excessively over recommended levels, the appearance moves towards the grey colour. The flux residue usually can not be seen by the naked eye, however, it is visible under a microscope at 50x magnification. Higher magnification SEM views of the flux residue are shown in the pictures below. 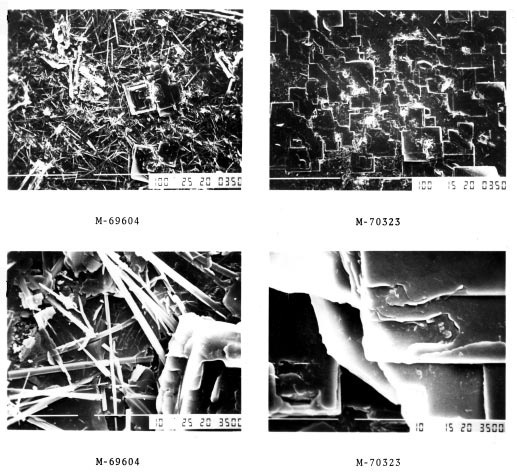 The pictures on the left are typical of a tunnel furnace brazed surface, needle-like in structure possibly including the odd flat platelet. The pictures identified M-70323 are typical of a furnace atmosphere containing higher than recommended levels of O2 specifically during the cooling cycle in a batch furnace. The morphology is almost 100% flat platelets. This surface has been reported to have better corrosion resistance in service. Typically 1–2 microns. This can vary depending on flux coating weight prior to brazing. The residue hardness is about 4 on the Mohs scale. No measurable loss has been found in circulation tests with freon or glycol type coolants using recommended flux loading. However there are reports that some detachment may occur where higher than recommended flux loading is used, particularly where molten flux pooled in downside areas. The post-braze flux residue has a hydrophilic (wetting) surface, however that wettability decreases with time. The presence of flux residue on the part surface mildly increases corrosion resistance under normal conditions. Solubility of flux residue is influenced by the method of measurement. A typical value are between 1.2 and 3.0 g/l with Al, F and K ion concentrations approaching the stoichiometry of the compound KAlF4 . There is a slight odour from minute amounts of H2S immediately after brazing. It disappears within a short time. If objectionable, the odour may be eliminated by rinsing the part with water. The flux residue provides a good base for coatings. However, thicker residues resulting from higher than recommended flux loading can result in the poor or non-adhesion of wet or dry powder paint coatings. NOCOLOK® Flux residue is not easily removed from the surface of brazed parts. Mechanical abrasion, such as wire brushing or grit blasting, can be used to clean off heavier flux residues from “robust” joints. No practical chemical cleaning solution has been found. Boric acid and nitric acid solutions at higher temperature will partually remove the residues, however the times required (~ 1 hour) and the dangerous fuming with nitric acid preclude their use. Basically, the best procedure is to flux the product properly so that there is no visible after-braze residues and therefore no flux removal required. Based on currently available information, there is no simple cleaning method for flux residues by washing or dissolving – i.e. there is no suitable solvent or chemical solution – without attacking (corroding) the substrate material as well. Usually, removal of flux residue can only be done by mechanical means. From solid surfaces and from robust joints, as well as from Stainless Steel fixtures, the flux residues can be mechanically removed by sand or grit blasting. Wire brushing is a second alternative for flux residue removal. We recommend using Stainless Steel wire brushes for cleaning. Rotating SS-wire brushed are suitable too – provided the surface areas are accessible. Brushes made from copper and brass should only be used when the cleaned surfaces are not exposed to any subsequent welding or brazing cycle any more, because copper traces from the brush (even dust particles) in contact with aluminum can cause severe erosion problems. Flux residue has a slightly higher solubility in strong alkalis and some acids. But in many cases the base materials (aluminum or Stainless Steel) will be attacked (corroded) by these chemicals too. A solution of hot boric acid (10 to 15%, 75 – 80°C) can be used to remove some of the flux residue from brazed assemblies. Aluminum dissolution by boric acid is relatively moderate. The immersion time necessary to remove the bulk of residues varies from 10 to 30 minutes. But even then the flux residue removal will not be 100% successful. Handling (preparation and usage) and discharging (waste disposal) of such chemical solutions can be problematic and expensive – due to their corrosive properties and the subsequently necessary waste water treatment. Considerations for health, safety and environment must be in accordance with the Safety Data Sheets. Ultrasonic treatment may be effective in removing flux residues, provided that the parts to be cleaned fit into the ultra sonic dipping bath. A detergent (cleaning agent) can be added to the solution to improve the cleaning activity. The use of Antarox BL 225 for ultrasonic cleaning treatment is probably feasible. However, when there are any other additional chemicals mixed with the Antarox-containing cleaning solution (particularly when adding acids or alkalis) their compatibility with Antarox must be verified. There are commercial solutions available for ultrasonic cleaning of Stainless Steel. More information on this subject is available from suppliers for industrial cleaning chemicals. Flux residue from NOCOLOK Flux can only be removed by mechanical means, i.e. using wire brushes or grit/ sand blasting. This is a very difficult and laborious procedure – and a very dirty one (dust formation!). Local exhaust and ventilation is needed in the work area where the parts are cleaned. There is no suitable solvent to take off the flux residue without corroding the base materials. Dust and dirt, condensates, lubricants and oils must be thoroughly removed. If the metal work pieces are poorly prepared, the flux will not spread evenly and the flow of filler alloy will be haphazard: it will either not spread properly or will discolour. The consequence would be an incomplete joint. The first step is therefore: always clean the components of all oil and grease. The surfaces can be cleaned using either chemical, water-based or thermal cleaning techniques and substances. Aqueous or water based cleaning is a quite efficient and robust process, but still generates some waste water. Aqueous cleaning starts off with a concentrated metal cleaning agent, which is subsequently diluted with water to 1% to 5% (v/v). The composition of a supplier’s cleaning solution is proprietary, but usually contains a mixture of surfactants, detergents and active ingredients such as sodium carbonate that serves to elevate the pH. Once diluted, the cleaning solution will typically have an elevated pH in the range of pH 9 to 12. There are acid based solutions, but appear to be less common. The best water-based cleaners contain water, tensides, cleaning agent and active ingredients such as carbonates. The cleaning solution works best at higher temperatures and is usually recommended to operate at 50°C to 80°C. Cleaning action is quicker at higher solution temperatures. Thermal degreasing works by elevating the temperature of the work piece so that lubricants present on the surfaces will be evaporated. This procedure only works with special types of lubricants known as evaporative or vanishing oils. Vanishing oils are light duty lubricants used mostly for the fabrication of heat exchanger fins, although they are now finding uses in the stamping and forming of other heat exchanger components. Lubricants not designed for thermal degreasing must not be used. These could leave behind thermal decomposition products and carbonaceous residues which at higher level prevent brazing and have the potential to degrade product appearance and accelerate corrosion.